Here we go again---the little 90 degree fuel shut off next to the carb on my 25 is leaking again. I ordered the smallest 90 degree ball valve Mc Master offers but it won't fit in the little space there. Looks like someone could make one that would last more than a year or so. Any one know of a better one available that would fit in that location? John M . Here are some pictures how i did it. I used a full flow 1/8" Ball Valve. I had problems flow through needle valves. A shut off that close to the carburetor is convenient but not great if you have a fire under the hood. I have one there on my car but I also have one under the floor boards just in case. I never felt comfortable relying on the shut off under the gas tank and if nothing else feel like it still leaves too much gas in the line to feed a fire. I posted my solution to this problem in 2009. I just looked it up, and the search worked. Click on "Keyword Search" above. 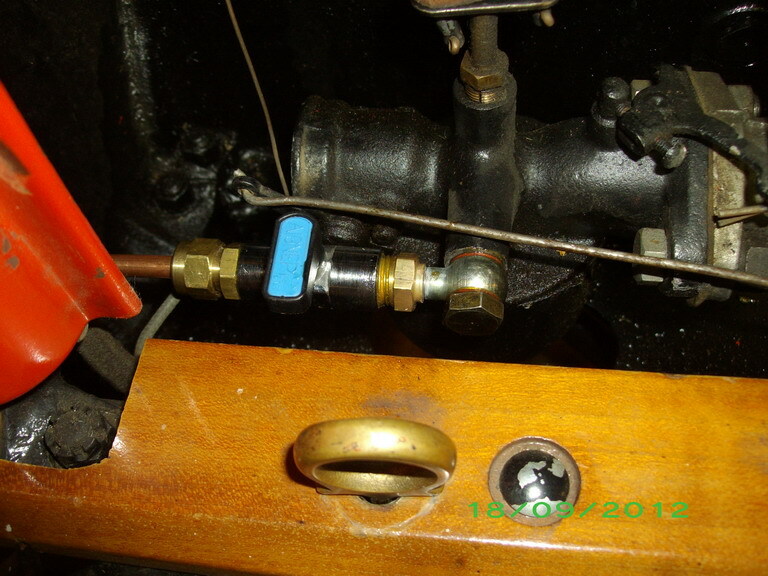 Then in the first line, type Fuel Shutoff Valve. Scroll down a ways and change 'where to look' to Heading. I was given 3 choices of posts that matched. Click on the first, which is dated Oct. 3, 2009. What about the vintage style fuel shut off that Lang's has? Can't remember the part #, but not hard to find. It's around $35 bucks or so. I just got one for my '12 but won't be able to put it on til spring when the engine comes back so can't attest to how well it works, but it looks pretty good quality to me. I looked at that one but it doesn't say "ball valve" so 35 bucks is a lot if it doesn't last. Any one know more about it? Andre, that's a pretty neat banjo fitting. Is that pipe thread on the carburetor? Or has it been modified as I suspect it has been? 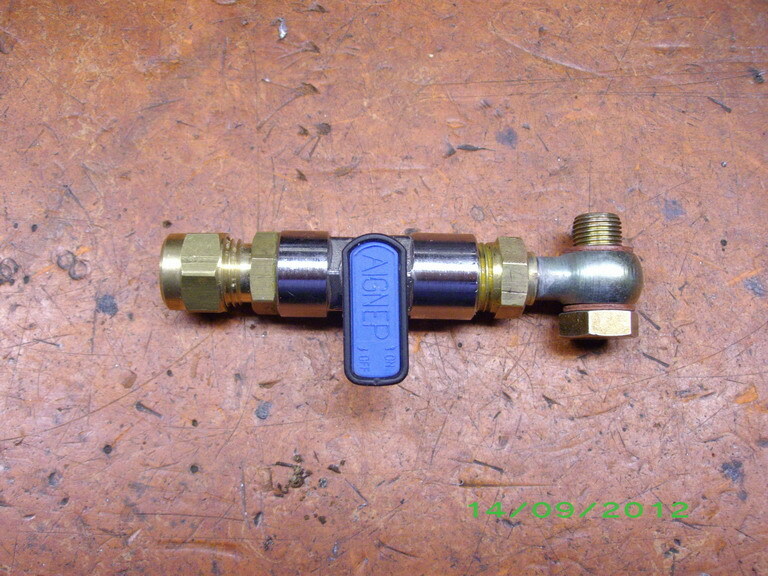 John - I have the vintage style valve offered by Lang's. It is made of brass and spring loaded so if it ever begins to leak, it can be taken apart and lapped. Mind has stayed fuel tight for the most part. It did start to leak but I reseated it and it has been fine since. I like it mostly for the aesthetics. Sure the others pictures above are probably better from a functionality standpoint but I would never have something modern looking like those under my hood. Ken : Yes the Banjo bolt is the original pipe thread on the carburetor. If you need to take off the carburetor, you only close the ball valve and take out the Banjo bolt. I used the traditional brass (OLD TIMEY) shutoff for years and swore I would never buy another one. My son found some ball valve shutoffs, like the ones that Boer shows, on the internet. Best change I've made to the gas shutoff problem. The brass ones sealed good but became VERY difficult to turn. I lapped them, used the aircraft seal/lub and most of the time had to use channel locks to turn them. Not so with the new ball valve. With a large pan with two inch sides under my T I left my line open once or more times. The NH that had never leaked before did this time coming out in to my garage there was about four gallons of gas in the pan. Its shut off now EVERY TIME. Good post Paul. Many have become complacent because their ol' reliable NH "never leaks", right? Well, as you have pointed out Paul, it only takes once! One thing I can't understand is why anybody would go to the trouble to install any kind of shut-off valve near the carburetor, but fail to provide some type of "union" between the shut-off valve and the carburetor. 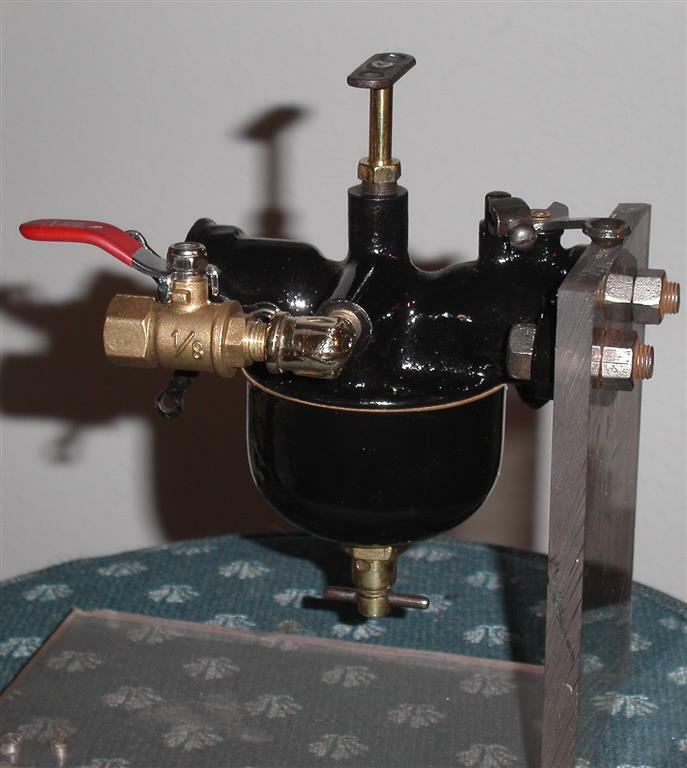 In fact, that 90 degree elbow with built in shut-off valve that the "T" vendors sell that screws into the carburetor makes no sense to me. If for example you want to switch carburetors for testing purposes or something, you can't disconnect the fuel line from the carburetor without crawling under the car to close the shut-off valve on the "potatoe"! With a "union" between the under-hood shut-off valve, you just close that valve and then break the union to disconnect fuel line from carburetor. And with that 90 degree elbow/shut-off valve, you can't install a union between elbow and carb, because with that elbow, there is just barely clearance for the hood as it is! And I believe that the reason a lot of guys don't shut the fuel line valve off is because it's too much trouble to crawl under the car every time to do it! By the way, I should have said that Anthonie B. 's banjo bolt enables what I'm talking about. For carb work, or carb change, just close the valve and pull out the banjo bolt! Bob Cascisa, with the set-up in the carb you've pictured, I believe you'd still have to crawl under the car to shut off the valve at the "potatoe" BEFORE you could disconnect the fuel line from the carburetor. 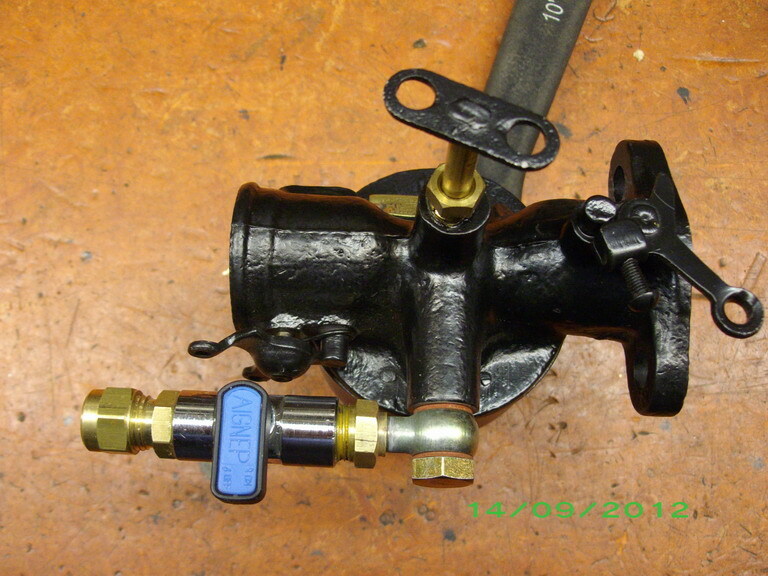 A "union" between that ball valve and the 90 degree elbow would allow you to close the ball valve, then break the union to disconnect fuel line from carburetor. You are correct. In the actual installation on my T, I have a 1/8" pipe to flare adapter where I connect the steel fuel line. I still have a second shutoff at what used to be the "potato". My goal was to have the shutoff as close to the carb as possible. When the valve is in the OFF position, the handle prevents the choke from operation and serves as a reminder to turn the fuel back on before I go. My shut off is under the floorboards. Everytime I struggle with the floormat to lift the floorboard I say I should move it to under the hood. Would be so much easier to use I think. The shut off in my huckster is at the output of the sediment bowl. I don't have floor mats so it's an easy thing to lift up the floor board and turn it off. I leave the board up to remind myself to turn it back on! I took it off, lapped it with valve grinding compound and lubricated it with soap. It now turns freely and doesn't seep. Hope it lasts longer this time!! !